Control technology should come from one source to ensure the consistent performance needed for efficient automation. We combine optimally scalable controller hardware with easily programmable motion control software for you. Our integrated control program covers extensive motion functions: from single-axis positioning and the electronic cam to robotics. What types of control technology are available? As well as sensors and actuators, controllers are a central element of automation technology. The term control technology or industrial control technology stands for devices that control, regulate, monitor, collect data, communicate, and diagnose. In a narrower sense, we understand "control" in automation technology as the influencing of a material or energy flow by a closed loop system in which multiple signals are processed. In turn, the result influences the closed loop system, and the input value influences the controlled output value. Stage 1 – Start: In 1784, with the use of mechanical looms that were further developed using wooden punch card controllers in particular and later using controllers with rotating belts for looms. Stage 2 – Start: In 1870, with the first ever deployment of assembly lines in the USA (in the slaughterhouses of Cincinnati), while using electric drives that were switched on and off using corresponding contactor and relay controls. Stage 3 – Start: In 1969, with the first ever Programmable Logic Controllers from the US-based company Modicon (the Modicon 084, invented by Richard E. Morley). These controllers marked the breakthrough in industrial electronics and information technology for the mass control and automation of production. Stage 4 – Industry 4.0. Start: In 2012, with the development and deployment of cyber-physical systems (CPS) for the globally networked and optimized control of production organized on an international level (Internet of Things). This gradual transition from the third to the fourth stage has been made visible to a wide audience at HANNOVER MESSE each year since 2013. In its simplest form, a PLC has inputs and outputs, an operating system, and an interface from which a user program can be loaded. This program determines how the outputs are to be activated based on the inputs. The PLC is connected to the machine or system using integrated sensors and actuators. Sensors in this sense include pushbuttons, incremental encoders, light switches, limit switches, and so on. The actuators used include, for example, contactors, electric valves, or modules for drive controllers (motion control, open-loop speed control with controlled acceleration/deceleration, incremental motor controls). A variety of different displays or visualizations show the status. In this case, the control logic (program) is produced by connecting relays (contact controls). The design is based on relays, which are usually used for simple control tasks. CNCs are used in machine tools (turning, drilling, and milling machines). Here, dual numerical codes that are stored in the controller map the workpiece to be created (which is why the name is "numerical control"). These coordinates are implemented in motion sequences for the workpiece by the CNC controller with the aid of software. These controllers were developed especially for industrial robots and are very similar in their logical design to CNC controllers. SEW‑EURODRIVE focuses on drive-level closed-loop control in control technology. Based on the application or machine, we combine scalable controller hardware with easily programmable motion control software. The integrated control program covers an extensive range of movement functions when doing so – from basic positioning using electronic cams to robot kinematics. 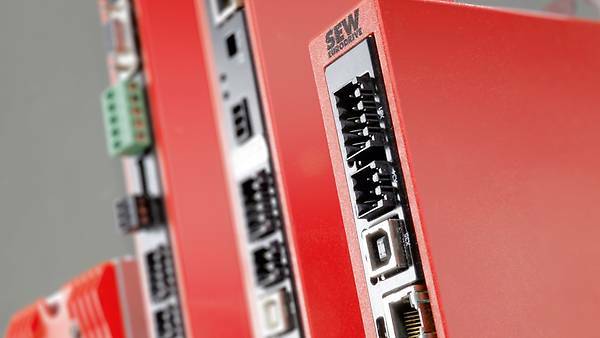 If you have to operate multiple axes with different drive solutions in complex motion sequences, you can utilize the SEW‑EURODRIVE controller hardware portfolio. Based on the needs of the application, the product portfolio ranges from classic control cabinet solutions to decentralized integrated inverter solutions. In the area of controller software, SEW‑EURODRIVE offers a wide variety of application modules in which you simply have to parameterize motion sequences for anything from handling units to production machines. Naturally, it is also possible to use the control software for more complex freely programmable movements . For visualization, of course, there are also suitable displays and operator panels. SEW‑EURODRIVE provides these features in its DOP series. For the MOVI-PLC® controller, the optional Windows operating system that we provide means the optimum basis for controller-based visualization solutions is available. Do you have a specific request and need assistance? Just send us a message with your questions.